This book was received from the Goodreads First Reads program, where you can enter a giveaway for the chance to win an advanced copy of many books. I believe by the time I received this book, it had already been released in shops, but it made me very happy that mine says ‘Advance Reading Copy’ on the back, and for an extra bonus, it’s autographed too! The book centers on Don Tillman, a very smart but socially awkward professor of genetics at a university in Melbourne. He has only two friends (Gene and his wife Claudia), and has never been on a second date. He’s perfectly content with all areas of his life, but for one thing. He wants a wife. His problem is that every woman he dates ends up having some problem; they smoke, they wear excessive make up, they’re vegetarian, they’re always late, and so on and so on. Don’s problem is that he has to sit through a date with these women before he realises what is wrong with them. He decides on a questionnaire to pre-filter his dates to help him find the perfect woman – ‘The Wife Project’. The problem is, once he has asked all the questions he wants to ask, it comes out at 16 pages long. He uploads it to his online dating profile and waits for the women to start contacting him. Days after posting his questionnaire, a young woman called Rosie turns up at his office. Don assumes that Gene has sent her following her submission of the questionnaire, but she’s actually there looking for his help as a genetics professor. She doesn’t know the identity of her father, and her mother died and only left her the clue that she was conceived at her graduation party. With Don’s help, Rosie thinks she can find her father, and so starts The Father Project. Throughout The Father Project, Don carries the assumption that Rosie turned up as a possible Wife candidate, but she’s the worst candidate imaginable, she smokes, she’s a vegetarian, she’s always late, and she has no regard for schedules. But somehow, Don doesn’t mind, and you can see him slowly falling in love with her, in his own way. Back to The Father Project, and Don tracks down an old graduation photo online, which happens to have the names of all the attendees written on it. Then starts the interesting and sometimes hysterical process of trying to get DNA from all these men without them knowing. Don has many sneaky ways of doing this, from stealing hair from a hairbrush, mopping pee off the floor of a bathroom, and even spending the night posing as a barman (which he was exceedingly good at, thanks to his spectacular memory). One by one, the men are eliminated from possible fatherhood, but just as they are getting to the last few candidates, Don’s awkwardness in social situations, or rather one social situation in particular, pushes Rosie and Don apart, and it seems like The Father Project may have come to an end. I’m going to leave my story review there, because I don’t want to spoil the ending for anyone wanting to read the book. As soon as you start reading, you’re immediately endeared to Don. Even though he’s not very good in social situations and he has routines for everything, including a 7 day set meal plan where he eats the same meal every Monday, every Tuesday etc to avoid the pain of shopping and concentrating on cooking new meals, he seems like the most charming guy and someone you would love to be your friend. He reminded me a lot of Sheldon in The Big Bang Theory, intensely clever but inadvertently funny. But throughout the book, I never found myself laughing at Don, just at the situations that he found himself in, like the Jacket Incident at Le Gavroche. There were many moments when I actually found myself laughing out loud, it’s a good job that I was at home. The writing drew me in completely and I devoured this book within a few hours, I just couldn’t bring myself to stop reading and put it down because I had to know what was going to happen next. I would love to read the book again later this year at a more leisurely rate to find the nuances of the book that I no doubt missed from being sucked in so completely. 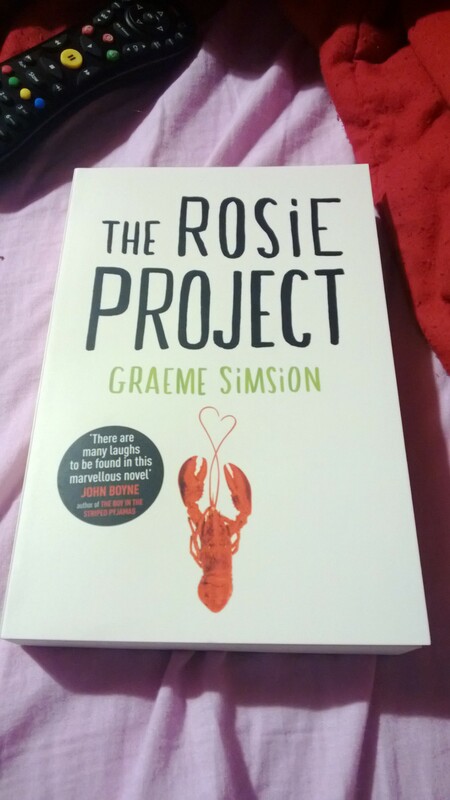 Graeme Simsion is definitely on my list of authors to watch out for, I would love for a follow up sequel to this story so that we can hear more from the lovely Don.